Amplification: Smartpass Amplifier for High and Low Gain with built in 3G/4G filter. Reception Pattern: Multi-Directional, Receive Signals from 360 degrees. Enjoy Watching FREE TV FOR LIFE! No more monthly cable bills! The AT-400BV HDTV Antenna with MULTI-DIRECTIONAL technological characteristics receives free broadcast High Definition Over-the-Air TV signals, such as ABC, CBS, NBC, PBS, Fox, PBS, Univision and many more. This TV Antenna is compatible with all HDTVs, Ultra High Defintion TV's (4K UHD) and digital to analog converter boxes. Engineered and designed in the USA by ANTOP, the antenna specialists, the Flat-panel AT-400BV digital TV antenna with NEW GENERATION DIGITAL TECHNOLOGY is designed to match similar gain of traditional bulky, unsightly mechanical antennas with an amplified signal reach of range from 0, 60 to 70 miles from point of origination to assure more channel reception and fewer blind spots. The AT-400BV includes VHF Enhancer Rods to strengthen VHF reception. Its UV coating, weather resistant finish and creative design, make the AT-400BV perfect for easy home exterior installation: wall, roof, balcony. It is also suitable for indoor use in an attic or placed on a table top. 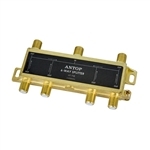 ANTOP was the first antenna manufacturer to include a built-in 4g filter in all their products to block 3G and 4G wireless signals to ensure noise-free digital TV reception. All ANTOP products come with 24-hour access to on-line customer support and installation assistance. The number of TV channels and programs that you can receive for FREE depends on the amount of over-the-air broadcasters in your area. With the ANTOP AT-400BV, there is no monthly fee and no need to subscribe. Just plug into a TV, scan the channels, and then enjoy your TV shows! and we will personally look up the TV reception strength in your area, let you know how many channels you will receive and recommend the best TV Antenna for your location. 1) Smartpass Amplifier, uses an all-in-one design for balance short and long range reception. 2) 4G LTE Filter: blocks unwanted 3G and 4G interference. 6) Includes Mounting Plate You can attach to a Pole, Railing, The Side of House etc. Within the past 6 Years we have helped over 83,000 customers find the Best TV Antenna for their Location. All items came as expected, no problems. Great TV Reception! Product came in excellent shape and performed above expectations. Good quick delivery, two thumbs up!!! Very well made product, your sales tech were very helpful and useful in choosing the right antenna for the remote area I was needing to cover, antenna was not able to receive the channels in this remote area (65 miles away) it was a great challenge for any ones equipment. Your sales staff (Marc's) was extremely useful in assisting trouble shooting.